Designer, Angela DeMontigny has been styling and designing for some of North America's most talented and well known performers, musicians, actors and celebrities for many years. Here are a selection of photos of her designs being worn on the red carpet, on stage, on the runway and on the street. Terri-Lynn Williams-Davidson and Robert Davidson rocking the red carpet in DeMontigny @ the 2016 Indspire Awards in Vancouver, B.C. Native actor/model Taysha Fuller captured by WWD on the streets of Park City, Utah during the 2015 Sundance Film Festival. She was in town to promote and screen her newest movie, Songs My Brother Taught Me. Top Chef Rich Francis making his runway debut as a celebrity model for DeMontigny @ the Premiere Glamour In The Hammer event in Hamilton, Feb. 2015. 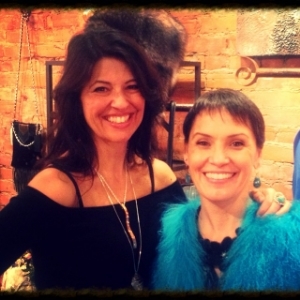 Designer, Angela DeMontigny with friend/client, singer/songwriter Susan Aglukark @ the Grand Opening of DeMontigny Boutique|Gallery, Dec. 2014. Terri-Lynn Williams-Davidson with Robert Davidson and Band @ The Museum of Anthropology, Vancouver, B.C.